There are a few basic guidelines when setting up your air compressor plumbing. Most of these guidelines are for efficiency and ease of use, however some are for safety. It is very important that your air compressor plumbing is safe. A burst pipe can be very dangerous or even deadly when it comes to compressed air. If you do not feel comfortable designing or installing your air compressor plumbing yourself, it is best to have a professional do it. Disclaimer: This website and its owners are not responsible for any injuries or damages incurred from installing or using compressed air systems. 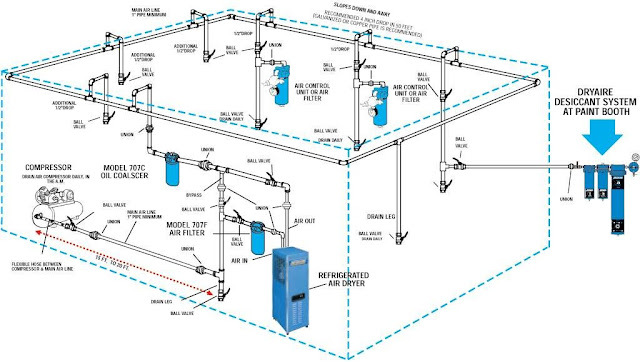 To help design your air compressor piping layout, also read How to Dry Compressed Air. 1. There should be a ball valve right at the outlet of the air compressor. This allows you to shut the air off for the entire system. If your air compressor plumbing ever gets damaged and bursts, you can shut off the ball valve and only the air in air lines will be able to escape instead of having to wait for your entire air compressor to empty. I shut off this ball valve whenever I will be out of the garage for more than an hour. It is very easy and cheap insurance. It also allows you to make repairs or changes on your air lines without needing to drain the whole air compressor tank. The internal diameter of this ball valve should match the rest of your air lines. If you use 1/2" air lines, then use a 1/2" ball valve. Most air compressor outlets are larger than you'll need so you will also need an appropriately sized reducer for your ball valve. 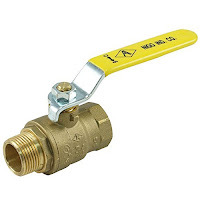 A male x female ball valve is ideal since the outlet of your compressor is female and the outlet of the air hose is male. 2. If you are using a hard material as your air line such as copper or iron, there must be a soft connection from your air compressor to the pipe. Air compressors create a lot of vibrations and if it is directly connected to your piping, all of the vibrations can lead to stresses in the pipes and possibly failure. Instead, after the ball valve, you should install a short piece or air hose to connect to your piping. 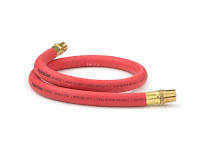 This short piece of hose is called a whip or lead-in hose and it serves to insulate your piping from air compressor vibrations. These can also be braided stainless to which are more resistant to the heat right at the exit of your air compressor. In the picture below, you can see the air compressor outlet reducer, ball valve, and lead-in hose. 3. Your piping should be sized appropriately based on the CFM output of your air compressor and the length of pipe you will be running. A drop in pressure can be expected through any pipe, but having a pipe that is too small in diameter for the length of the run required can lead to too much pressure drop. 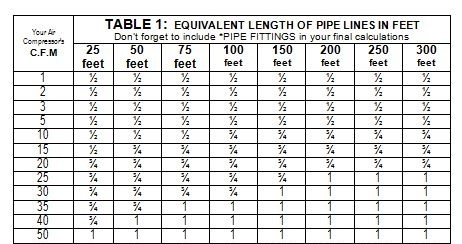 Below you fill find a chart that will help you determine what diameter piping you should use. For most home powder coaters or shops, you'll most likely be using 1/2", 3/4", or 1" piping. When using larger diameter pipe like 3/4" or 1", the entire system does not need to be this size. It is acceptable to do the horizontal loop in the larger size and then neck down to 1/2" for the drops. It is okay to size your pipe larger than needed without any negative effects, except cost. Some benefits of larger diameter piping is that it increases the overall capacity of your air compressor and it provides more surface area to the air, allowing the air to transfer more heat into the piping so it can cool down more quickly. I personally use a very minimal amount of pipe for my compressed air system. I have a two-car garage with a 60 gallon air compressor outputting about 12cfm @ 90psi. My piping run is about 25 feet and I use 1/2" diameter copper pipe, however, I could have used 3/4" diameter pipe as well. The only reason I didn't was to keep costs down. 4. You should aim to use as few elbows, Tee's, and connections as possible. Every single fitting you use contributes to pressure losses in your compressed air system and these should also be considered when choosing your piping size. If you know you are going to need a lot of bends due to the layout of your space, then it is best to go up at least one size in pipe. The table below shows the pressure drop through some common compressed air fittings based on CFM and pipe diameter. (ELL refers to elbows). 5. The horizontal piping running around your space should not be completely level and instead should be sloped either away from or towards your air compressor. The choice of which way the pipes should slope has been debated about since the beginning of time so I will leave the option up to you. My train of thought is that it is best to slope away from the compressor with the flow of air and towards the moisture filter or drain. The important thing is that the pipe slopes, ideally about 1" every 50 feet. The point of this is that you do not want water sitting stagnant anywhere in the pipes and this is a possibility if the pipes were all level. 6. Design your system so that there are no low-spots where water can collect. Air compressor piping should all run from the top down so that gravity can assist water downwards where it can be collected or drained from the system. Horizontal pipes should be run overhead with vertical drops running down to the air outlets. These vertical pipes are called drops and these are where you will connect your filters, air hoses, etc. The amount of drops you have is a personal preference. A shop with multiple workers and a lot of area should have a lot more drops than a home garage. Just keep in mind, that every drop you have should have its own particle/moisture filter to catch any moisture of debris before it runs into your air hoses so there is a higher cost associated with each drop you decide to add. 7. Drops should all run off the top of the horizontal pipe and then curve back down. The exception to this is the last drop unless you have a closed loop system. What this means, is that wherever you want a drop, you should have a Tee coming pointing upwards on the horizontal pipe, then two elbows to coming from the Tee to get it pointed downward again, and then you can have your drop. Because you make your air hose connections to the drops, it is best to minimize the amount of water that can enter the drops. With the drops coming off the top of the horizontal run, most of the water in the horizontal run will remain in the horizontal run instead of running down towards your drops. Notice in the picture below, how each drop runs off the top of the horizontal run except for the last one. The last one is where most of the water will collect and it can be drained from the system with a ball valve. 8. Each drop should have a length of pipe and a ball valve at the end to collect and drain water. Also, any connections you make to the drop should Tee off of the side of the drop and run upwards. This further allows gravity to assist in making sure that all of the moisture runs towards the bottom of the drop to be drained. You can see in the picture below how this would work. 9. Run at least 25 feet (more is better) of piping before your first drop. This initial piping before the drops allow the hot compressed air to cool down allowing the moisture to condense into a liquid allowing your moisture filters to catch it. 10. 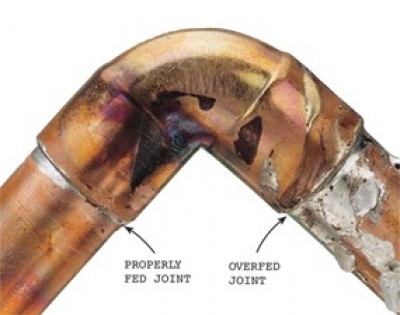 You should install unions in several locations throughout your compressed air piping if using copper, iron, or steel. 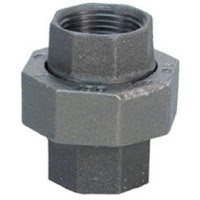 Unions allow you to easily separate the pipes using a threaded nut. 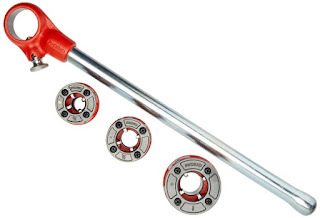 This allows you to easily disassemble your pipes for maintenance, additions, or removal. Closed Loop or Linear Compressed Air Plumbing? This refers to the horizontal run of pipes around your space. A closed loop system runs up from your compressor and Tee's into pipes running in both directions where it meets on the other side of the room. There is no beginning or end, just a continuous loop. This can be seen in the picture below. This setup is ideal for larger garages or shops and especially if there is more than one person using compressed air at the same time. A linear system is what can be found in most home garages. The pipe runs from the compressor and ends somewhere else in the garage. This is fine for one user with a short length of piping that goes that has drops on one or two walls. However, if you have drops on 3 walls in a room with 4 walls, there is no reason not to complete the loop. The benefit of this is that the drop that was originally furthest away from the air compressor with the highest pressure drop, now has a much shorter path to the air compressor and will have much less pressure drop. Air compressor pipes come in many materials, but the most common ones found in a garage or shop are copper, black iron pipe, or a aluminum or polyethylene system like RapidAir. Each of these have their pro's and con's. I will review each of these below. I do not recommend PVC pipe as it can shatter sending shrapnel through the air. Copper piping is one of the best choices for affordable compressed air piping. It is my first choice and what I would recommend so it will be discussed more than the other options. It is lightweight, corrosion resistant, somewhat easy to assemble, and has a very smooth bore which reduces frictional pressure losses with air. One of the most beneficial things about copper is that is an excellent material to cool the compressed air flowing through the pipes. This allows the moisture in the air to condense into a liquid allowing you to catch it with a water filter. It is most commonly sold in 10 foot lengths from $14 to $20 depending on which type you get. While the pipes themselves are more expensive than black iron pipe, the fittings are cheaper than iron fittings. One of the downsides to copper pipe is that it must be soldered together. Luckily, all of the tools required to do solder copper pipes and fittings are very cheap and there is not much of a learning curve. The very first copper fitting I ever soldered in my life has never leaked and is still fine to this day. 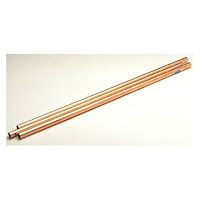 Hard copper pipe comes in three wall thicknesses. Type M is the thinnest, then Type L, and Type K is the thickest. Type M or L pipe will last many years in home garages or shops. 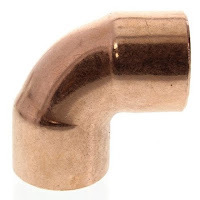 I have had no issues with the thinnest Type M copper pipe in my home garage but in a shop, where the copper pipe has more of a chance of being bashed up against by something, Type L copper pipe would be more suitable. If you want to play it very safe and don 't mind spending the extra money, there is Type K copper pipe. 1. First the copper pipes must be cut to the desired length using an appropriately sized tubing cutter. 2. The cutting will leave an edge on the inside diameter of the pipes that must be removed before soldering, this can be done with a de-burring tool. 3. Once your cut is made, you must remove any oxidation from the pipes where it inserts into the fitting. This should be done by using emery cloth on the outside of the copper pipe and the fitting until the copper is shiny. The first inch or so of the inside of the pipes and fitting also need to be cleaned until shiny. This can be done with an appropriately sized wire brush that fits your pipe. 4. Now that your pipes are cut and cleaned, you will apply a very light coat of soldering flux on the outside of the copper pipes and on the inside of the fitting. This only needs to be applied where the two meet together. Do this for each pipe and you can then press them together. Make sure the pipe is fully seated into the fitting before continuing. Wipe off any excess flux. I highly recommend the tinning flux linked above as it is very easy to get a leak free solder joint. 5. You must prepare the entire fitting before soldering. If you are using an elbow fitting, you must have two copper pipes prepped, fluxed, and inserted into each end of the elbow before soldering. If using a 3-way tee fitting, then three copper pipes prepped, fluxed, and inserted into each hole before soldering and so on. You do not have to build your entire piping system all at once before soldering, but the fitting must be completely assembled. 6. To do the actual soldering, you will need a propane torch head and propane cylinder. While the heads are cheaper online, the propane tanks are only about $4 at your local hardware store. 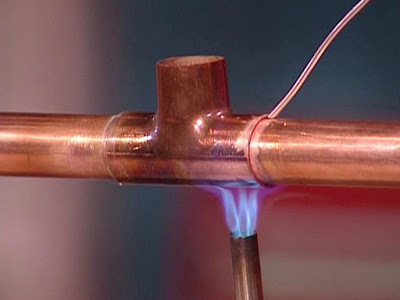 You will use your propane torch to heat up the middle of the copper fitting, do not aim it at the solder joint. Unroll a length of solder and hold it on the joint on the opposite side of the flame. Once the joint is hot enough, the solder and start to flow into the joint. Start to move the solder around the joint until the entire joint is soldered. You do not want to add too much as it can glob up inside the joint. Once you finish soldering one side of the finish, move your copper to the next side of the same fitting and repeat. Once all sides of the one fitting are soldered, you can remove the torch from the joint. If the next joint you are about to solder is close to the previous joint, you can wrap a wet rag around the completed joint to keep it from re-melting. If you have to solder close to a wall you can hang up a soldering pad on the wall to prevent burning down your garage. 7. Once your solder joint is completed, wipe the joint with a damp rag to remove any excess flux. The flux is acidic and if left on the pipe, can cause corrosion. Also inspect the solder joint to ensure that is filled in completely. It seems like a lot of steps but once you get into the groove, it really is not difficult. I did all of my copper air compressor plumbing in one night and there has never been a leak. These are pretty self-explanatory. They come in short radius and long radius. The longer radius elbows flow a little better and are a little more expensive. These can come in one uniform size such as 1/2" x 12" x 1/2" or they can have a combination of sizes in one fitting such as 3/4" x 1/2" x 3/4". If using 3/4" or 1" piping, you can neck down to 1/2" copper piping for the drops unless you have a very large compressor and are moving some serious air. The picture below shows a piping zig-zag which is used to cool the compressed air in an effort to remove moisture. You can see where the tee fittings are needed. 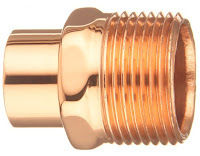 The male threaded fittings allow you to make connections to anything with female NPT threads. This includes air filters, water separators, hose reels, ball valves, etc. 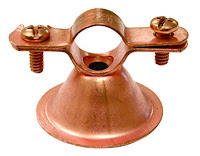 These are not a fitting, but are very handy for mounting your copper pipe to the wall and they are very cheap. They are all copper construction so there is no chance of corrosion due to dissimilar metals. They also mount the pipe away from the wall so you don't have to worry about vibrations. These mount to the wall with a single drywall screw, which pair well with standard drywall anchors. That pretty much sums of copper pipe as a way to plumb your air compressor throughout your work space. 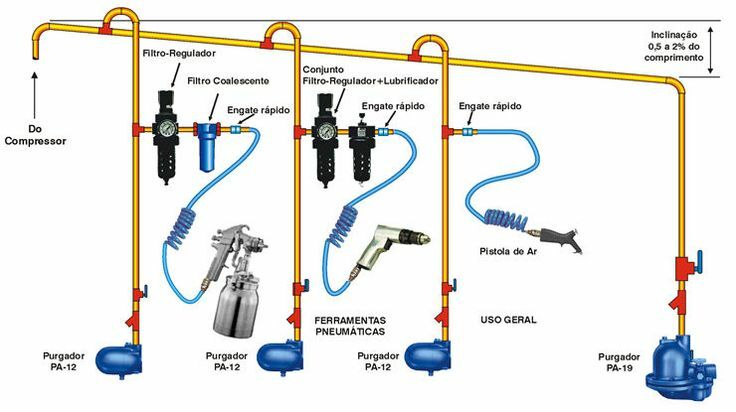 With the above info, you should have just about everything you need to get design and assemble your compressors plumbing. Now onto the other popular choice for plumbing. 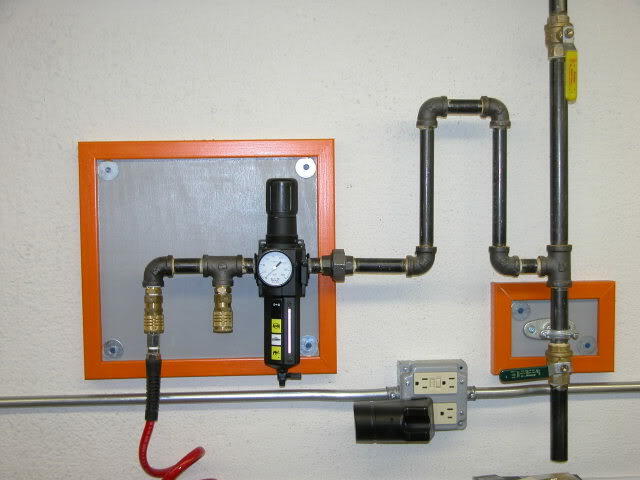 Black iron pipe is another popular choice for plumbing an air compressor. It can be slightly cheaper than copper piping and it is very heavy duty. Instead of needing to be soldered together like copper pipe, it is threaded together. You can buy it at the local hardware store in 10 foot sections. The downside of black iron pipe is that the interior of the pipe is prone to corrosion from the moisture your air compressor produces. They will still last a very long time, but a good air filter is a must to catch any debris from the pipes corroding. Another downside is the tools needed to assemble them which can be somewhat expensive. These pipes need to be threaded in order to assemble and they must be tightened very tight to keep them from leaking. 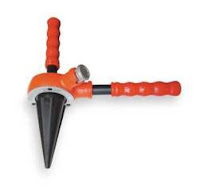 You will need some specialized tools to thread black iron pipe, or another option is if you purchase it locally at Home Depot or Lowes, they will cut and thread the pipe to your specifications for free as long as you buy the pipe from them. Call your local store to confirm that they do this before planning out your black iron pipe plumbing. If you decide you want to tackle threading the pipes yourself to avoid a bunch of trips to Home Depot, you will need an appropriately sized tubing cutter to cut the pipe to the desired length, an appropriately sized pipe reamer to deburr and smooth the cut, and an appropriately sized pipe threader to cut threads into the pipe. You will also need pipe threading oil to lubricate and cool the tool as its threading. 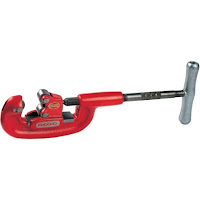 Harbor Freight also sells a discounted pipe threader if you want to try that route, just make sure to save your receipt because it doesn't have the best reviews. Once you have your threaded pipes and fittings, you can begin assembly. Make sure to include lots of union fittings throughout the system. If you don't use any union fittings and you decide you want to do something like add a quick connect fitting in the middle of the system, you will have to take apart all of the piping, starting from the end, up until that point. And then reassemble it all. A set of union fittings allows you to make changes within the plumbing without needing to do lots of dissembling. 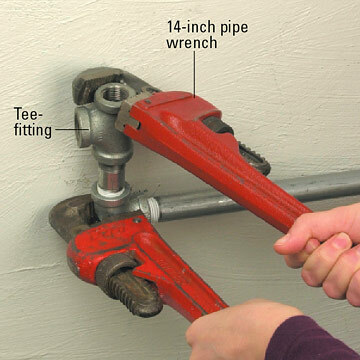 To assemble the pipes, you will need at least 2 pipe wrenches to tighten the pipes together. You will also need teflon tape or pipe joint compound, commonly referred to as pipe dope, to make the threaded connections air-tight. Pipe dope seems to be superior to eflon tape as it usually seals better and there is no risk of little shreds of teflon tape running through the plumbing and getting caught in your air tools. When assembling the pipes and fittings, you apply the pipe dope to both the male and female threaded sections of the pipe and hand tighten them. Then tighten a pipe wrench around the pipe and another one around the fitting and tighten the crap out of them. Keep in mind that black iron pipe is heavy and it needs to be securely mounted to the wall. I would recommend mounting it directly to the studs whenever possible. 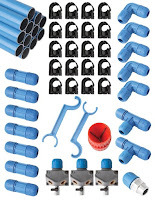 RapidAir among other companies offer ready-made kits that offer a several lengths of pipe and decent selection of fittings. They make these kits with either aluminum pipe (RapidAir FastPipe) or polyethylene tubing (RapidAir Maxline). I strongly recommend the aluminum pipe over the polyethylene kit. The polyethylene material does have a thin layer of aluminum sandwiched in the middle of the material but it is more to give the pipe form and not so much for helping to absorb heat from the compressed air. Removing heat from the compressed air allows the moisture to drop out of suspension where it can be caught by a water separator. The aluminum FastPipe systems from rapid air are a very nice kit however. Aluminum is very good at absorbing the heat from the compressed air allowing the moisture to drop out of suspension and it is a nice and lightweight material that is resistant to corrosion. The pipe comes in either 3/4" or 1" so is suitable for large air compressors. The system looks very professional and systems like it are often used in large manufacturing plants. The piping is also powder coated blue, so the slight chance of the aluminum ever corroding is not a worry. Another great thing compared to the other piping materials is that you don't really need any specialized tools with this kit. The downside of the aluminum RapidAir system is that it is a little more expensive than assembling your own copper pipe or black iron pipe system. 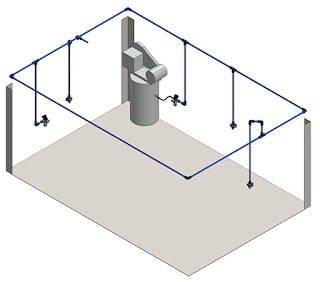 All the components available in the system are sold individually if you ever want to expand or change your compressed air plumbing, however they are somewhat costly and not much is available locally. Other than those couple of cons, it is a very nice system and looks great in any shop / garage. With the advice from this article, you should be well on your way to setting up the plumbing for your air compressor. 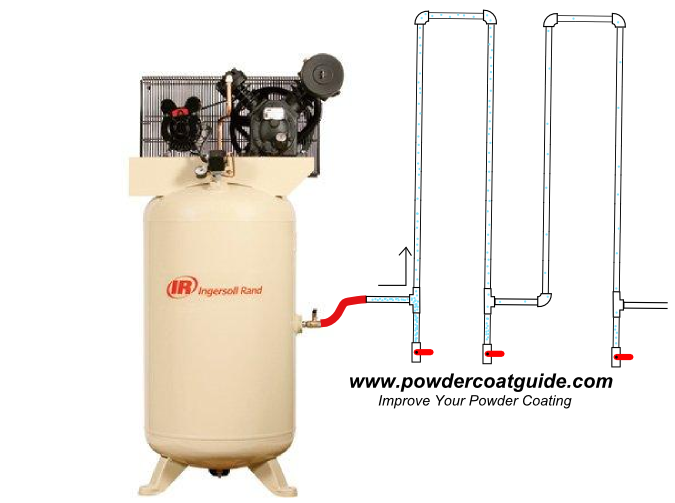 Remember that a good compressed air system can make life much easier while powder coating in your garage or shop. You can design a system that eliminates moisture in your compressed air and also offers you convenient quick connect couplers wherever you need them. To help design the system, make sure to also read How to Dry Compressed Air as the concepts from that article should be included in your plumbing design. If you have not yet purchased an air compressor, check out Choosing an Air Compressor. The air coming directly our of your compressor is very hot and when the air is hot, the moisture is suspended in the air as tiny little water molecules. It is not very easy to catch these molecules with a filter/dryer. However, if you run a 20 foot section of copper pipe away from the air compressor, the air has a chance to cool down considerably as the heat is absorbed by the copper. When the air cools down, the water molecules begin to accumulate into flowing liquid water and this is much easier to catch with the filter/dryer. This web page says "Avoid copper tubing, as it is easily damaged; and soldered joints can come loose under pressure (Safety Hazard)." So what am I to do? I just down have the tools to use black pipe. Well copper will be softer than black iron pipe and if it soldered very badly, I would assume that it could blow apart under pressure. However, copper pipe is very commonly used and failures are very rare. I personally use copper piping for my air compressor. I like TP tools as a company but I do know that they sell black iron pipe setups which could potentially be why they are saying to stay away from copper piping. I think they are talking about copper tubing not copper pipe. Sean once again you have hit the ball out of the park. I recently re ran all my air lines when I changed over to a Rotary screw air compressor w inline refrigerated dryer. I looked everywhere for an article that would help me build a better system than I had before and by far your writeup was the best one out there. So once again you really helped me. First w my oven and then w my air line system. Whenever I write anything for this site, I try to be as comprehensive as possible. It's great to hear that it helped you Jared. 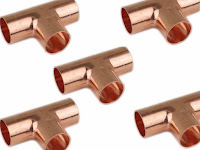 The biggest problem with copper is overheating the joints while using soft solder. One option is to use silver bearing solder (2% is fine) as used in refrigeration piping. It makes a stronger joint, but takes a bit more heat to apply.